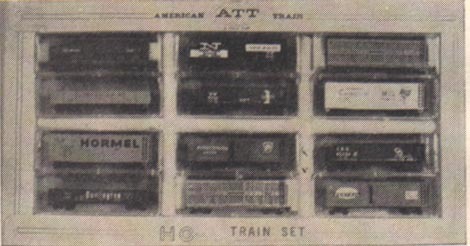 Packed in a train set sized box, ATT offered a collection of 12 HO-scale freight cars for $18 in 1968. No roadname is provided for the loco on this set. The 1969-70 catalog picture suggests the model carried only a number on its side. The set included a 40' Sliding Door Box Car; 40' Gondola; Caboose; a circle of Atlas section track and an ATT power pack. The 0-4-0 Steam 3-Cars set was priced at $21.98. ATT's Alco Century 415 headup this 1969-70 set. Also featured was a 40' Sliding Door Box Car; 40' Gondola and Caboose. The set also contained a circle of Atlas section track and ATT power pack and sold for $23.98. The set is also listed minus the power pack for $17.98. 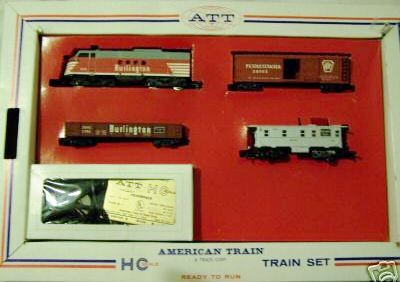 This set is featured in ATT's 1969-70 catalog and is displayed with the DDT Switcher pulling the 40' Sliding Door Box Car and 40' Gondola, plus Caboose. The set included a circle of Atlas section track and an ATT power pack and retailed for $22.95. 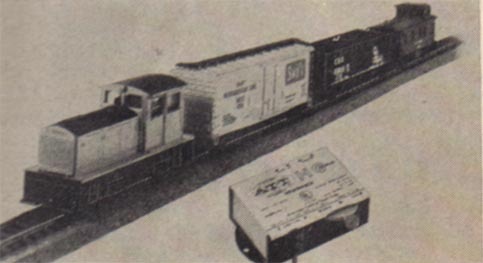 Included in ATT's 1969-70 product catalog, this set featured the company's F9 pulling a 40' Sliding Door Box Car; 40' Gondola and Caboose. The set also contained a circle of Atlas section track and ATT power pack and sold for $23.98. The set is also listed minus the power pack for $17.98. 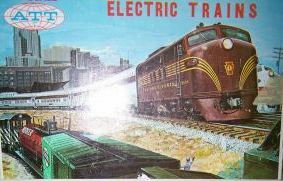 This set included the Plymouth DDT Switcher pulling two freight cars and a caboose around a circle of track with power pack. Retail price for this set in 1968 was $22.95.